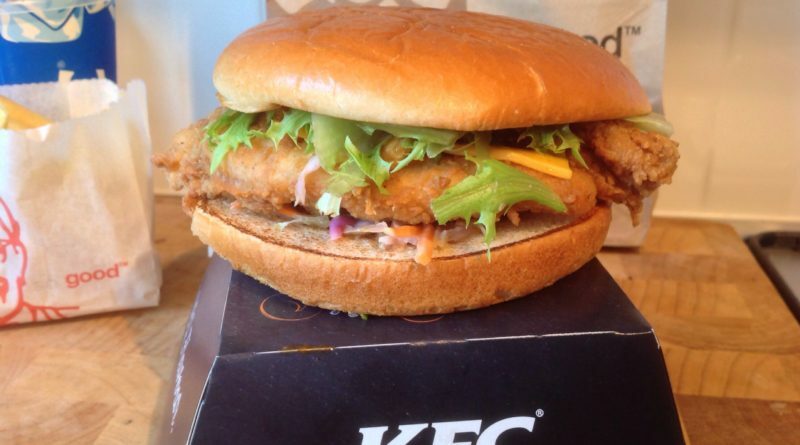 KFC Pulled Chicken Ultimate Burger - Price, Review, Calories & More! 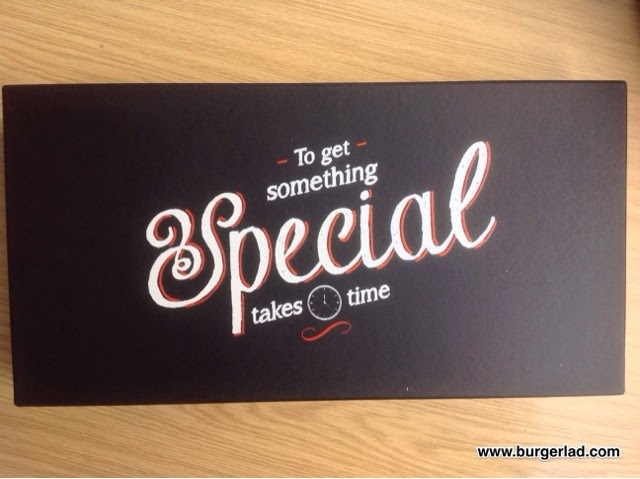 To create something special like our new Ultimate Burger takes time. 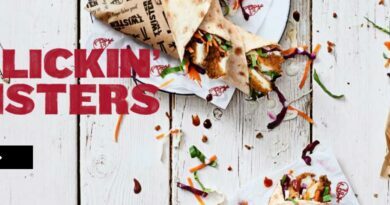 Now you can delight in slow-cooked, BBQ Pulled Chicken, draped over 2 crispy Mini Fillets on a bed of Southern-style paprika slaw. All topped off with lettuce, cheese and a softly toasted Brioche bun and served with a drink and fries. Make the most of every mouthful. Price: £5.39 as part of a meal (subject to variation). Calories: 637 kcal for the burger only. 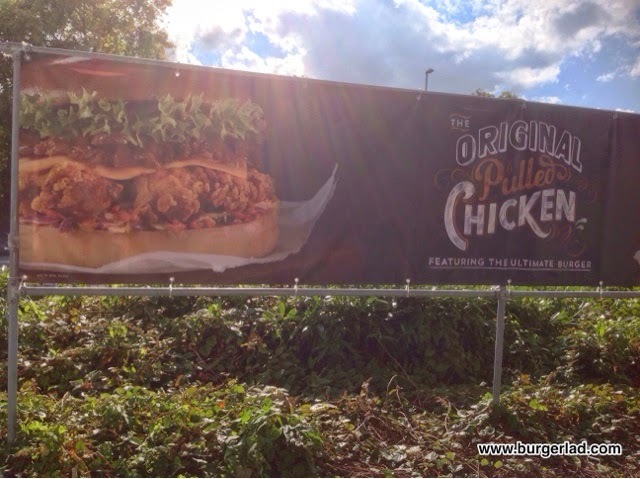 Arriving shortly before KFC’s 50th anniversary we are treated to a new product from the purveyor of poultry – The Pulled Chicken Ultimate Burger. The pulled chicken is made-up of 60% white breast meat and 40% dark meat. The meat is first tumbled in a dry spice rub which includes smoked paprika, clove and chilli before being marinated in a molasses-based sauce and slow cooked for almost two hours. 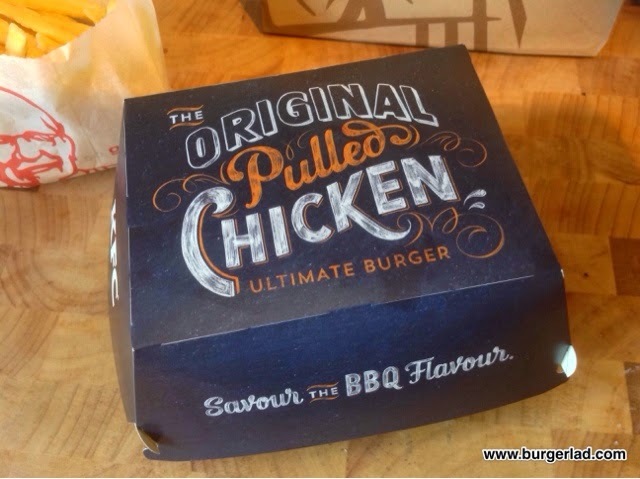 Burger Lad® had notification recently of this new product launch coming on Monday 1st September and on this very special of days we received a package by courier. Inside, there was a mysterious black box with “To get something Special takes time” scribed on it. We looked in the box to find some fantastic vouchers, a personal note and an awesome shopping bag. Love it. We’re no strangers to pulled pork as we regularly cook up a batch at BLHQ for our own creation the PFT but how would this compare? 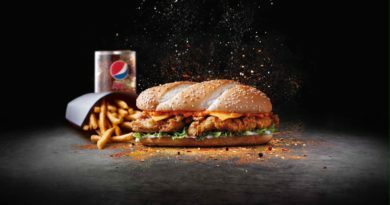 The Colonel is serving up pulled chicken for some Kentucky Fried Realness with their latest promotional burger. 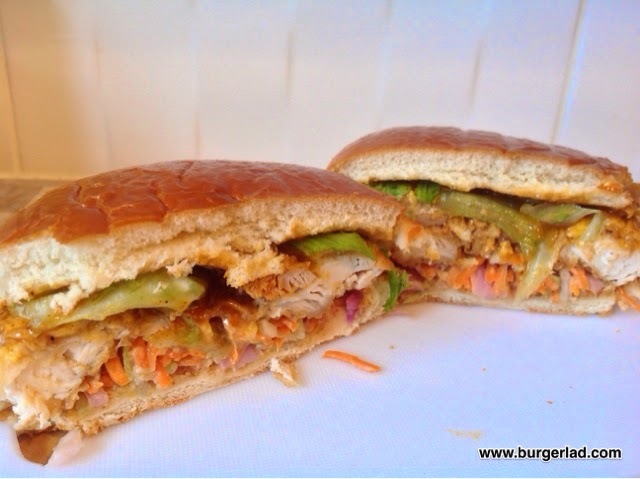 On this, the Ultimate Burger you get the BBQ Pulled Chicken and 2 x Mini Fillets on a Southern-style paprika slaw. My mouth was literally watering as I typed this in anticipation. But we had one problem – well actually three, in the form of Burger King’s new promotional items coming Tuesday 2nd September. We hit the drive-thru in the evening as unfortunately we could not get to this promotional item as quickly as we would have wanted to. We’re going to analyse each single component for this review and then provide an executive summary at the end. BBQ Pulled Chicken – obviously the ingredient on this burger under the most scrutiny… even more than the voucher which paid for this Ultimate Burger Meal. This had a very sweet taste to it, a slight hint of BBQ but very subtle. 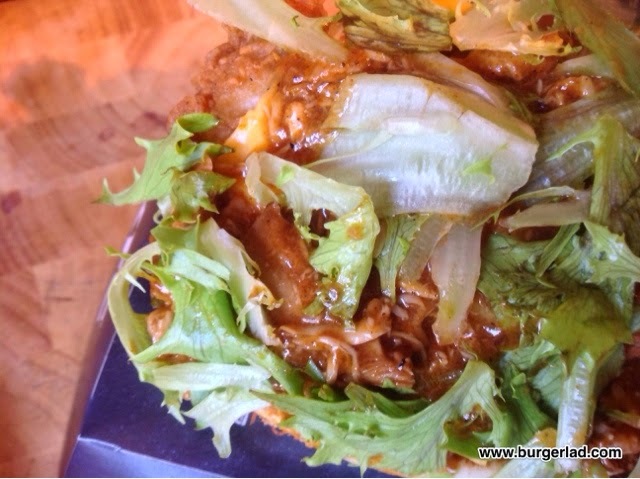 I’d possibly add a bit more of the pulled chicken to this burger but as it stands it certainly avoids a slop-fest. A respectable ingredient and an interesting “innovation” from one of the major brands. Crispy Mini Fillets – your standard mini fillets contribute nicely to the overall textures going on here. So you have the softness of the pulled chicken contrasted with the crispy crunch to mix it up a bit. That combined with the secret recipe flavour we all know and love gives me the hunch you’ll be trying this for lunch. Paprika Slaw – this was actually really very good and consisted of a combination of carrot, onion and cabbage I believe. Very enjoyable and a million miles away from the sickly sauce found on the McDonald’s Great Tastes of America Memphis Special. Works well with the chicken and provides additional sweetness through the slight paprika spice to it. Lettuce – another good addition. Mine was fully loaded with lettuce and we couldn’t get a real good look at the pulled chicken because of this. Gone was the standard issue iceberg variety to be replaced with this fresh, peppery salad. Good. Cheese – standard American cheese style. One of the only components I failed to pick out. It was on there definitely but I found it got a bit lost, I don’t think you would notice if it was missing and KFC could drop it to lower that calorie count even more. Not good, not bad just there. Brioche bun – a brioche can divide the burger community like two football teams can divide a city. Some love them, some loathe them. I’m sort of sitting on the fence when it comes to this argument. 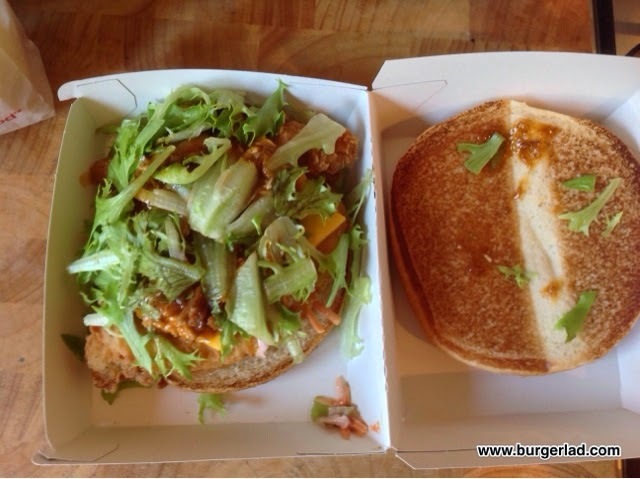 The brioche served to me today was toasted correctly, had a healthy glazed exterior and coped easily with the pulled chicken and other ingredients found on the Pulled Chicken Ultimate Burger. Overall, I thought this was a very respectable new release from KFC. Calling it the “Ultimate” burger may be pushing it a bit but it is enjoyable all the same. There is no real spiciness to this burger and the flavours coming to your palate are sweet, slightly smoky and with a faint hint of BBQ. The slaw is bordering on domineering but not quite in my opinion. Anyone looking for the flavour to blow them away will be disappointed. It’s all about subtlety with this burger and that mix of the semi-gooiness of the pulled chicken vs. the crispy snap of the mini fillets. And this works well. Closer look at that pulled pork… I mean chicken…! At 637 calories it’s also not the most obscene burger on the High Street. 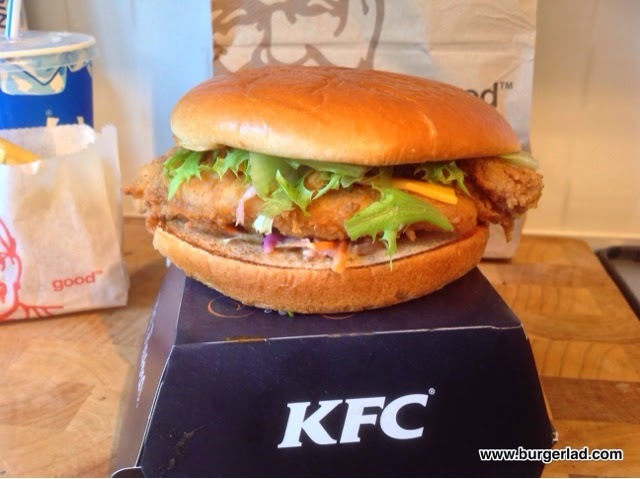 I may even re-visit KFC in the near future to sample another and I don’t say that too often about any promotional burger. 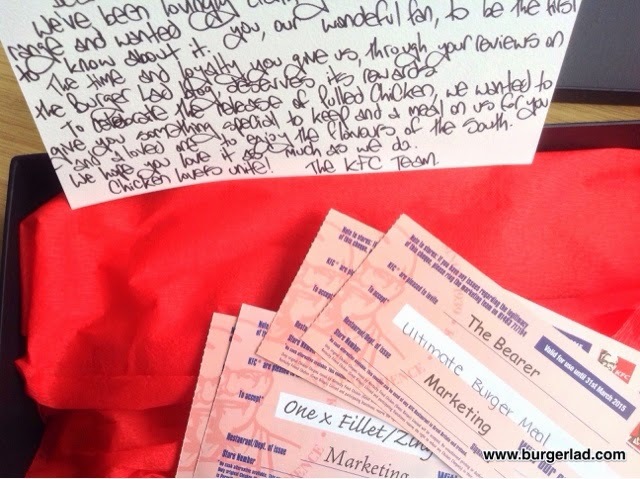 It was really very cool to receive this marketing pack from our good friends at KFC so we really appreciate that guys. The bag is awesome and I loved the personal handwritten note in the box as well. KFC recently launched their UK and Ireland Twitter account and we are honoured to have them following us. We hope to build on this relationship and review many more promotional items in the future. 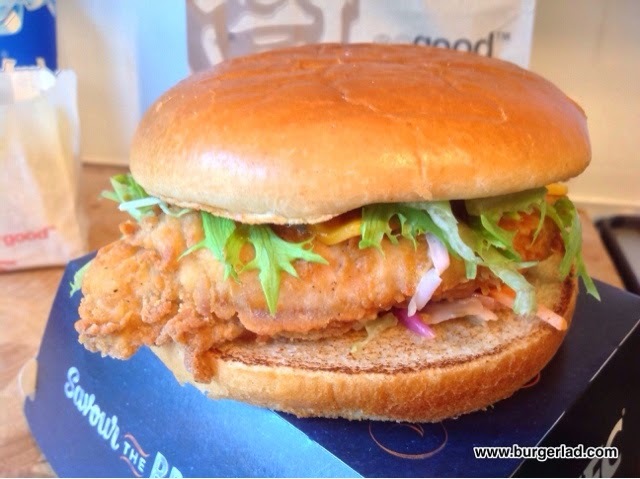 With that let’s take one last look at the KFC Pulled Chicken Ultimate Burger – a sweet, BBQ beauty that’s sure to be popular on the High Street and drive-thrus across the UK. If you’re tempted I’d certainly recommend it – you won’t be disappointed! And if you are tweet us and let us know your opinion on the latest promotional item from the Colonel or leave a comment. I was so excited about this after seeing many of the posters around London. 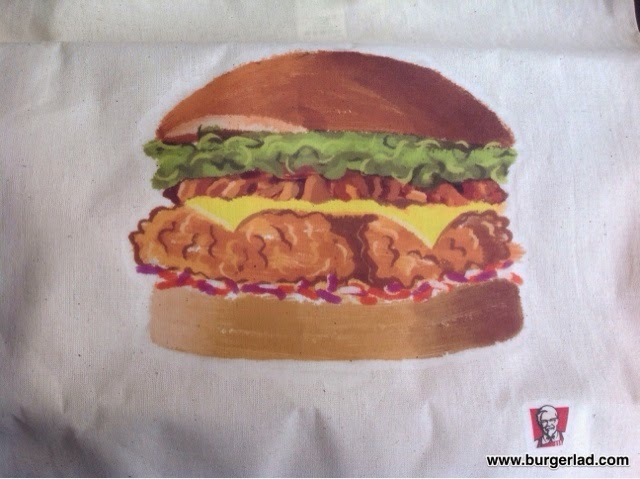 After taking a nice long lunch at work, sitting down and taking my time, I have to say that this is probably one of KFC's worst special edition burgers. Totally tasteless…..lets start from the top, the brioche bun is actually a nice edition as I've seen quite a few burger places popping up using these, so good choice. The pulled chicken, supposedly in a bbq sauce…no flavour, nothing exciting, and actually it seemed to be hiding the dryness of the chicken. 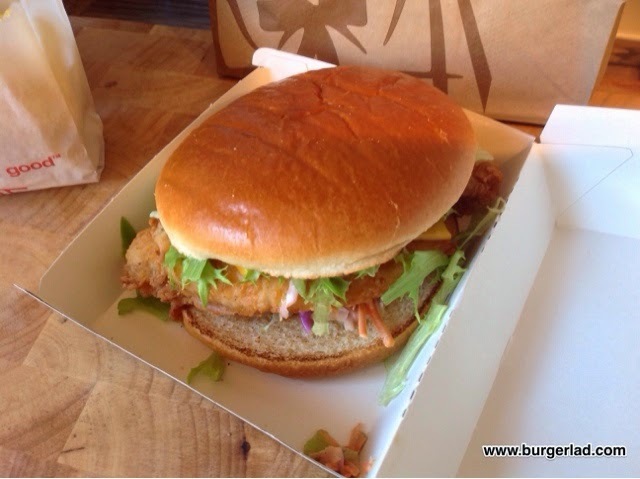 The fried chicken fillet isn't a fillet, its actually 2 boneless breast strips which as a standard piece of KFC wasn't too bad, probably the best part of the burger. Though because it's not one piece it doesn't seem to hold together very well. The coleslaw…again what the hell is this bland, over the top with carrot mess…It sits under the two fillets and just soaks in to the bun, no flavour at all except for the over bearing shredded carrot. Don't get me wrong, i like coleslaw, in fact KFC's own isn't too bad, but this special "southern" crap is a waste as they could have used a better sauce, something like the Superchargers spicy sauce. At the end, I walked away very disappointed, I will not be buying this again, I can't wait for it to end and be replaced with something hopefully a lot more flavourful. I seriously wonder… did KFC introduce this to recycle leftover chicken and coleslaw? There are many American fastfood chains do that. Windy's come to mind with their popular chili which is actually just dry left over burgers that get cut to small pieces and made into a chili! Honestly I'm having that doubt, thats why I googled the burger and thats how I ended up at this blog post. After reading Sohail Ahmad comment about how the sauce is used to hide the chicken dryness… i think that confirms my suspicion. I'd be more interested with a confirmation or decline though. I thought it had taste, but a bad taste. I think I went in expecting the worst, after all, what good could ever come from pulled chicken? It sounds like how chicken nuggets are made! I found the burger very dry and didn't like the chewiness of the pulled chicken.